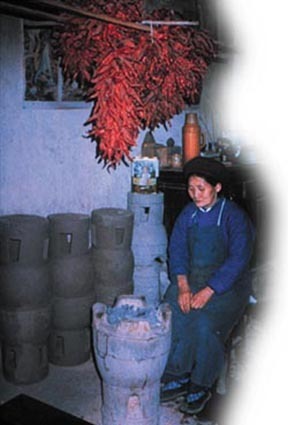 Earth and its materials have affected human health for thousands of years. Recent events have put the spotlight on the evolving field of medical geology and earth scientists are key players. Robert B. Finkelman, et al. Not all earth materials are friendly to humans. Here we look at the current status of some infamous culprits and some emerging problems. When drought hits the Sahara, the number of asthma attcajs increases on some Caribbean islands. Armed with remote sensing images that track global movement of dust storms, reasearchers are investigating links between dust and human health. The USGS last year released findings on arsenic in groundwater. When policy-makers begin to act on these data, scientists find that presentation can make all the difference. 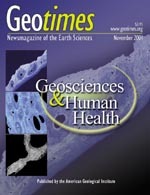 The November Geotimes features stories on how the geosciences affect human health. Geomedia's popular On the Web links are now available by topic! Visit these recommended earth science friendly Web sites. Change in Where on Earth? For those of our readers who are responding to November's Where on Earth? contest, you have until Nov. 28 (postmark dates) to reply, instead of Nov. 19. We are making this change to account for the possibility that some of our readers may receive their magazines late, due to the challenges currently facing the U.S. Postal Service. An international summit jump starts efforts to protect growing populations from natural hazards. Geologists are perfect candidates for making changes at the local level. ON THE COVER: Mineral Density: A backscattered electron image of bone showing its mineralization density, which relates to its strength. This image is a sample from biopsies of women in a clinical trial for a new osteoporosis medication, courtesy of Susan Ott, a professor of medicine, and Scott Kuehner, a geologist, both at the University of Washington. See story.